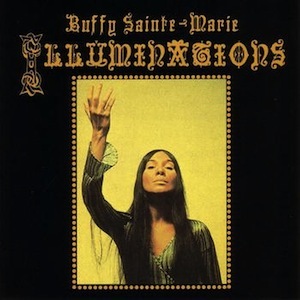 Beginning with 1967’s Fire & Fleet & Candlelight, the music of Cree folksinger Buffy Sainte-Marie began to take on a decidedly schizophrenic nature. Traditionally celebrated for her biting political songs, as well as her stark approach to folksong, the late sixties saw her take her distinctive sound in a series of surprising directions. Candlelight experimented with sweeping orchestral arrangements and electric pop music, while its follow-up, I’m Gonna Be A Country Girl Again, saw Buffy immersing herself deep in Nashville traditions. Come winter, 1969, and the young firebrand decided to turn the tables once again, releasing what is perhaps her most esoteric album of all: Illuminations. From the very first notes you know you’re in for something unique. “God Is Alive, Magic Is Afoot” is an eerie, electronically treated adaptation of lines from Leonard Cohen’s novel Beautiful Losers, featuring bizarre production touches courtesy of Vanguard Records president Maynard Solomon himself. Buffy’s voice and guitar are taken and warped into distorted moans and oscillating loops of sound that build upon themselves into a kind of electric witch’s chant. I should warn you not to get too comfortable with all this, though, because if this record is anything, it’s unpredictable. After almost five minutes, this unsettling opening fades into the short, church organ hymnal “Mary,” before a gnarly electric guitar and banjo jerk into the rapid-fire folk-rock of “Better To Find Out For Yourself,” featuring Buffy at her yelping, wailing best. In the clucking fadeout, what might return but Solomon’s electronic screeching, teasing the record back down into a dark, candlelit vampire ballad. Honestly, I could go on for the entirety of the track list like this, as every song here is’€ indispensable to the whole. In fact, I’m almost tempted to label this one a concept album, with the opening track acting as a sort of manifesto. As for the music, though, it’s everywhere, from the raw west coast psychedelia of “He’s A Keeper of the Fire” to the caustic “Suffer the Little Children,” which itself sounds straight out of one of Buffy’s earlier records. One of the most wild segments is when the stomping “With You, Honey” closes with a shrill scream and dissolves into the pretty, lilting acoustic love song “Guess Who I Saw In Paris.” This latter track is so overly cute that in any other context I might write it off as a low point, but in context with the rest of the music here it somehow comes off as extraordinary. Like the rest of the album, it’s hard to really put the magic into words. This is one you just have to experience. Truly fantastic album; it’s too bad that BSM herself doesn’t seem to think much of it — if I recall correctly she doesn’t even list it on her own website. Ballerina is a disappointing MOR followup however and folks who dig this should check out Moonshot and Changing Woman — which sounds like the pop AM radio version of Illuminations — next. I have a hard time understanding why some people really don’t like this record; it was love at first listen for me. “Better to Find Out for Yourself” and “He’s a Keeper of the Fire” are my two favourites, but I always listen to the album in it’s entirety. I found the album to be one of Buffys best. I think that people had a hard time letting go of thier conceptions as to what Buffy should sing. She has never been afraid to branch out and try new thing. Not to be missed is her latest recording “running with the drum”. Douglas — Imight make you feel better… Apparently that’s web legend as I saw her speak a couple months ago and she said she loved Illumnations. I was glad because I agreed with you, its great and very original, and it was a favorite for electronic music lovers like me. She sang God Is Alive, Magic is Afoot in her Canadian tv special Up Where We Belong a few yrs ago. Blew me away. She also rerecorded it for her album of the same name. Its listed on her website buffysainte-marie.com And to Mike, yeah, Running for the Drum is her best yet. Powwow Rock?? She’s such a pioneer.